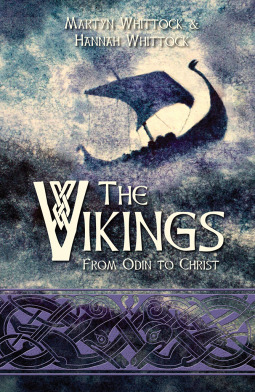 Although this book is subtitled “From Odin to Christ” and is ostensibly a book about the ‘Christianizing’ of Scandinavia, the truth is that this is a really phenomenal, brief history of the ‘Vikings.’ I put a quote around ‘Vikings’ because, as the Whittocks explain, ‘Viking’ is something you did (you went viking) and not something you were. The research here is tremendous and although the presentation feels somewhat brief, there’s a strong sense that the information behind the presentation is accurate. Although I have long been interested in Scandinavian history, this book reveals some very interesting information – so much so that I can’t say what it all is without repeating so much of the book. Suffice it to say that I was not aware that we knew so much about which groups of Norsemen (those from Denmark, Norway, or Sweden [or at least what is now referred to as these areas]) invaded which areas. I was not aware that the Norsemen vikinged so far east and southeast – I thought they worked primarily in Great Britain, Iceland, and points west. There is also another factor that may have prompted the start of Viking raids. The late-eighth-century Danish attacks on the Frankish Empire and the British Isles coincided with changes occurring in the far off Middle Eastern Islamic Caliphate from the 740s onwards, as the Umayyad dynasty lost out to the new Abbasid dynasty and the centre of political power shifted from Damascus to Baghdad. These distant political and economic changes disrupted the flow of silver to Scandinavia. For some time Islamic merchants and their middle men had brought silver to northern Europe to trade it for the products of the north: slaves, furs, amber. However, the violently shifting politics within the Caliphate were followed by its fragmentation and a decline in central authority. As a result of this, in the late ninth century the Caliphate lost control of the silver mines in what is now Tajikistan. This precipitated a crisis in Scandinavia. Scandinavian economies began to falter as trade with the Islamic world declined. It was now harder for (suddenly silver poor) Scandinavian elites to engage in traditional gift-giving which cemented social bonds. Raiding offered an alternative method of obtaining both precious metals and slaves. The book does address the adoption of Christianity by the Scandinavians and we get just as thorough a documented history of the rolling conversion from paganism to Christianity as we did the rest of the book. From noting that “women in the Icelandic context seem to have played an important role in the conversion” to recognizing that “A new deity was not the issue: it was the exclusivity of Christianity that was the challenge” this book covers a lot of ground and unlike the history books of my school days, this is presented extremely well. The almost conversational writing style makes this very easy to read. My only down-side to my Kindle ARC is that the footnotes are not hot-linked so I couldn’t read the notes or check the resource while reading this. For that reason, this is my holiday wish list because I am confident I will want to refer to this book again and again. Looking for a good book? The Vikings by Martyn Whittock & Hannah Whittock is a well-written, well-researched book that will appeal to lovers of history, Christianity, Scandinavian culture, Norse mythology, and anyone who just enjoys a good non-fiction read.